It’s a beautiful summer in full bloom but, unfortunately, more and more cases of Lyme disease are being reported. Many people are looking for natural ways to repel ticks without having to use harsh and dangerous chemicals. You’ll be happy to know that there is one alternative that is a sweet smelling, yet powerful way, to fight against these disease carrying creatures. Don’t fool yourself into thinking that you don’t need to do anything to keep ticks at bay because you will simply just “pull off” a tick should you find one. While it’s true that ticks can be removed fairly easily, but by the time an infected tick bites you, it’s too late. Lyme disease is a tiny microorganism that varies from country to country, but in America, that microscopic bug can cause you a world of hurt. Many people experience flu like symptoms, but for some people, this disease becomes chronic. Along with those flu like symptoms, people experience arthritis, chronic fatigue, skin problems, neurological problems, and a lowered motor function of the lower extremities. 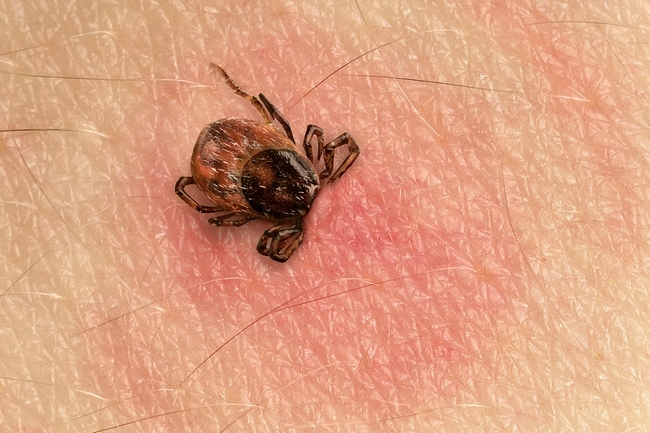 It’s much better to avoid a tick bite to begin with than to deal with health problems later should you get bit by an infected tick. It helps to understand how ticks operate. Ticks go by their sense of smell. They don’t fall out of trees or jump around like fleas do, they find you through a process called questing. Ticks will climb to the top of blade of grass, rock, or plant and stick their front legs up in the air, checking out the air for victims. Even if you find one in your head, it crawled up there. Ticks legs have a fantastic thing called Haller’s organs, which search for smell, movement, temperature, and carbon dioxide. They can actually smell you coming! They see you as a place of warmth, moisture, and food! There is one thing ticks don’t like, however, and that is the scent of rose geranium essential oil. There are two types of rose geranium oil, so in order to get the most tick repelling force for your dollar, look for the one with a botanical name of pelargonium capitatum x radens. There is another very popular oil which is from the same family, called pelargonium graveolens, but it’s not the same species. Many essential oils need to be diluted but this one does not, as long as it is used in small doses. All it takes to repel ticks, however, is a few drops on each ankle, on your wrists, a dab behind the knees, and one on the back of the neck, and you are set. You can use this on your dogs as well, but since their noses are much more sensitive to smell, use a bit less. Place one drop behind each shoulder blade and one on the base of their tail, which should be enough to do the trick. Avoid your dog’s face or nose as they are extremely sensitive and can’t handle any smell that is too strong. There are other oils such as cedar wood, lavender, eucalyptus, citronella, and lemongrass that have been found to be useful in repelling these annoying little insects, but many claim that rose geranium oil works the best. You should check specific directions for whichever oil you choose as to how to dilute them, if this is required, before using them. No matter which scent you decide to use, take precautions and always check yourself, and your dog, thoroughly after walking through the woods or tall grasses. You should note that rose geranium is a single oil, it’s not a mixture of rose oil and geranium oil. Not all oils are recommended for animals, especially horses and cats. Consulting your vet before you apply any essential oils on your pets would be a wise decision.